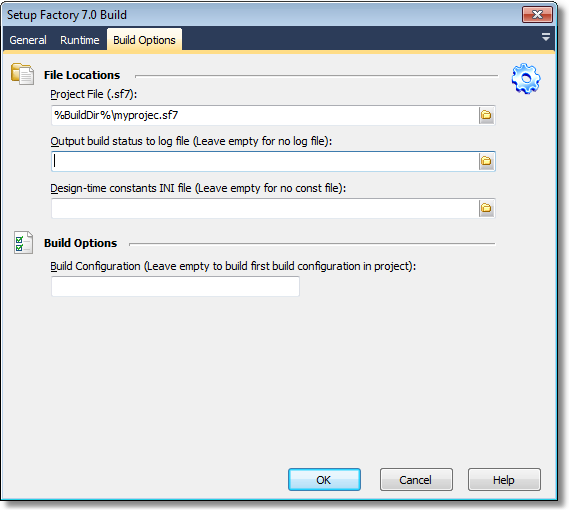 The Setup Factory action allows you to automate building of Setup Factory installers as part of the build process. Before running this action, you need to set up the Setup Factory Options. This is accessed via the Tools menu, Options. The fully qualified path and filename of the Setup Factory 7.0 design environment executable. The file is always called “SUF70Design.exe” and is usually located in “C:\Program Files\Setup Factory 7.0”. The fully qualified path and filename of the Setup Factory 7.0 project file that you want to build. This file must have been previously created and saved using the Setup Factory 7.0 design environment. By default, Setup Factory project files are saved in “My Documents\Setup Factory 7.0 Projects”. Specifies a log file to output build status to. If the file exists, the output will be appended to it. If the file does not exist, it will be created. For example, “C:\Output\Setup Build Log.txt”. Leave this field empty if you do not want to create a log file. Leave this field empty if you do not want to use a constants INI file. Specifies the build configuration to use in the build. If left blank, the first build configuration found in the project is used. If your project only has one build configuration, you can leave this field empty.